My grandfather and namesake, John Mitchell Bell, called “Pop” by everyone, was a foundry man who worked in Bonsack, an area and train stop just outside of Lynchburg where the United Tobacco Equipment Company was located. The United Tobacco foundry made castings that could be finished in the company’s on-site machine shop. When the Great Depression hit, Pop, then in his mid-forties, lost his job. For months, as the story goes, he sat in a rocker on his front porch and talked to everyone who passed by. However, the loss of his job did not keep him idle for long. Having no skills other than those needed for foundry work, Pop asked himself what he could do to utilize his experience as a skilled molder. He started reflecting on household items—things that people of all stations needed—and one day, he came in for lunch and told my grandmother Emma, known affectionately as “Big Momma,” that he had decided to open a small foundry to make coal-stove grates and stove liners. Everyone used them to heat their homes and would hopefully find a means to pay for them. 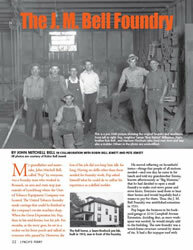 Thus, the J. M. Bell Foundry was established sometime in 1931. Pop began the business in his backyard garage at 3216 Campbell Avenue Extension, deciding that, as more workspace was needed, he would simply add to the building. The new foundry was a wood-frame structure covered by sheets of tin. It had a flat tarpaper roof with very little ventilation. Workers would open the few windows and double doors at each end of the building and hope for a little breeze to make it bearable. Foundry work was hard, hot, and dangerous. All of the men wore long-sleeved shirts to try to prevent arm burns from the molten pellets that scattered when they accidently spilled some iron. As a child, I was only allowed to watch from the door, but one day I managed to sneak inside and a molten pellet dropped into my shoe; I stepped down on it and—sixty-three years later—still have the scar from that burn on the bottom of my foot. On Thanksgiving afternoon, November 28, 1946, after pouring metal all day, someone left a piece of wood too close to the furnace and the foundry caught fire. With all the tarpaper on the roof, it burned hot and fast. Even though the building was outside the city limits, the Lynchburg Fire Department responded because Pop said he would pay the twenty-five-dollar fee for service to Campbell County. The firemen had to run hoses a block away, at Pocahontas Street, and that delayed things. I remember both my father and Pop urging the firemen to forget the foundry; they knew all was lost there. 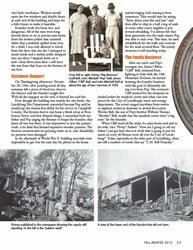 It was imperative to save the pattern vault, a tin shed that housed expensive wooden patterns. The firemen concentrated on spraying water on it, and, thankfully, no patterns were damaged. In the aftermath of World War II, building materials were impossible to get, but the next day the phone at the house started ringing with messages from customers. They would start by saying “Sorry about your fire and loss,” and then offer to chip in a half a keg of nails or some other scarce supplies to put toward rebuilding. I’ve always felt that their generosity was the main reason Pop was able to start over. This time, he used cinderblock for the walls and concrete for the sand-covered floor. The sturdy structure is still standing today. Entire article available only in printed version. Lynch's Ferry is on sale at the following Lynchburg locations: Bookshop on the Avenue, The Design Group, Givens Books, Inklings Bookshop, Lynchburg Visitors Center, Old City Cemetery, Point of Honor, and Walgreens on Boonsboro. John Mitchell Bell is a native of Lynchburg, graduating from E.C. Glass in 1955 and Duke University in 1959. He was then commissioned an officer in the U.S. Navy and served for twenty-one years. After retiring from the Navy, for the next twenty-three years, he supported several of the Navy’s shipbuilding programs in Washington, D.C. He worked on the Fast Frigate FFG 7 Class and the AEGIS Cruiser and Destroyer programs. John is an Eagle Scout, and was a Scoutmaster, a deacon and elder in the Presbyterian Church, serving twice as both treasurer and buildings and grounds chairperson. After losing his only daughter in an accident at the University of Virginia in 1987, he served as co-chapter leader of a parents’ support group called The Compassionate Friends and later spent eight years serving as the regional coordinator for the organization’s Virginia and D.C. chapters. He and his wife of forty-nine years, Mary McCampbell, enjoy traveling and cruising, and visiting their son and family in Fort Worth, Texas.